iCliniq › Ask a doctor online › Health Articles › Decreased Concentration In Work › How to Avoid Ergonomic Health Hazards? People across the globe have different work ethics and different work environment. All of us are supposed to work in the given atmosphere. Some work in industries, hotels, companies, manufacturing sites, coal mines, etc. People face a lot of difficulties in work, which may be company's financial growth, workload, divide and rule policy, etc., but out of so many problems what matters most is the health issue that remains unanswered. We never think about this health aspect because we are more focused on the completion of work and the employee efficiency. But how many of us have actually related this work efficiency with the rising health problems? Nearly 40 to 45% of people working in a bad work environment have realized the fact that the work efficiency is reduced because of deterioration of health. Hence, the health issues have become the biggest unsolved question in today’s work field. Because of the inefficiency of the employees, the company's growth has reduced to 20 % marginally over the last 2 to 3 years. Therefore, it becomes very important to identify what are the requirements and what precautions should be taken to avoid any accidents that lead to health issues. How do I cure my burning upper back pain between the shoulder bones? After drinking beer, my brain works fast. How? How to manage back pain that started after playing Foosball? A guidance control team consisting of a physician, an orthopedic, a neurologist, counselor, and a rehabilitation team comprising of a physiotherapist and an occupational therapist. Twenty individually wrapped sterile adhesive dressings appropriate for the work environment. Normal sterile water or saline water (0.9 %) should be kept to wash eyes if irritable. Antiseptic creams, lotions, and liquid. Knee caps, ankle straps, and shoulder slings should be present in the emergency room. Stretcher bed should be provided if any immediate accidents occur. Therapeutic balls of different size should be there for relaxation, which can be taught to the employees during intervals. Kinesio tapes and crape bandages work wonders for any strain, sprain or muscular injury of any body part. Gloves, masks, and eyeglasses should be present in the coal mines, industrial and manufacturing companies, where the workers work in a very risky environment. The big machines cause hazardous conditions. How to Prevent Accidental Health Hazards? There should be a place for the employees to speak about their difficulties, for which counseling classes should be taken for the employees twice a week. In these classes, the counselor or the educator should inform the pros and cons of working in an unhealthy environment, how they can overcome such situation, and how they can modify these problems. 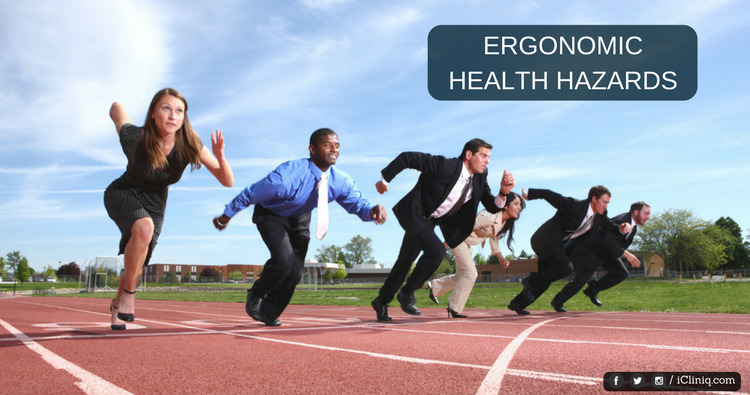 Some ergonomic classes or breaks should be conducted for two hours every day, where a physiotherapist teaches stretching exercises, strengthening exercises, some aerobics, and proper sitting postures to prevent any muscular disorder. Recreational activities should be conducted to avoid stress and work overload. Proper posture maintenance should be taught to the employees and workers to prevent backaches and muscular pain, which might arise due to long standing or long sitting working hours. Spine and trunk rotation exercises and active exercises for joint stiffness should be advised. Head and neck stability and mobility should be taken care of to prevent any kind of headaches, neck pain or spondylitis. Stretching exercises and mobility exercises for individual small joints (wrist joint, shoulder joint, elbow, hip, knee, and ankle joint) should be done at every two hours interval. Meditation and breathing exercise should be made an integral part of every company. This brings balance and improves the efficiency of the workers. It also decreases the chance of any neurological disorder that arises due to stress. These are some of the requirements that should be taken care of to avoid some dreadful onsite health hazards. Do you have a question on Decreased Concentration In Work or Physiotherapy? Is there any way to tackle my concentration problem?